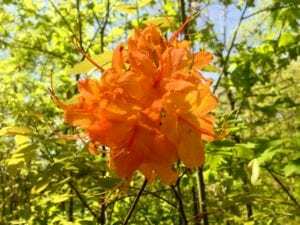 In the Great Smoky Mountains, flame azalea flower colors range from white to peach to orange, yellow, or red. Blooming time is April and May in the pine and oak forests at low to mid-elevation, but not until June or early July on the mountain tops. The famous displays on Gregory Bald bloom in mid to late June and on Andrews Bald in late June. Flame azalea can also be seen on Balsam Mountain Road.